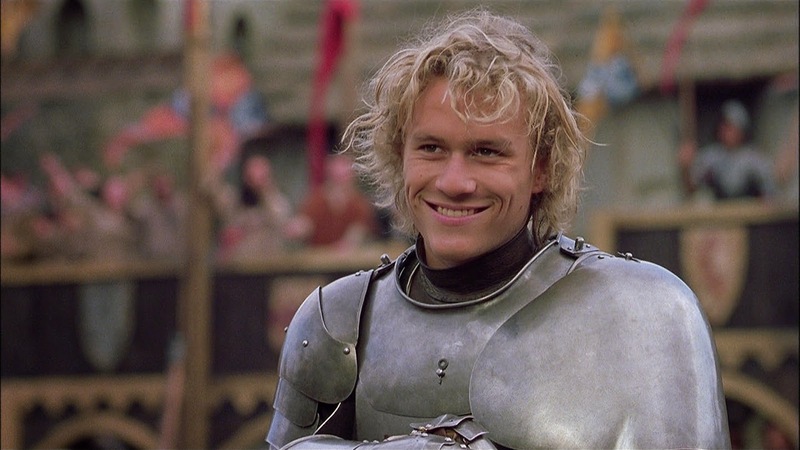 "A Knight's Tale" tries very hard to be one of the year's most carefree good times, but its lapse in logic creates a deafening interference for the moviegoer to deal with. Few people have probably not heard by now about how the movie uses a classic rock soundtrack against a medieval setting, but even fewer might not realize just what kind of intense distraction this has on us, not just as sensible viewers but as moviegoers in the spirit of silly summer thrills. It's great to have fun, but even the most mindless occasions call for a little plausibility, and this is the kind of movie that has no interest whatsoever in at least operating inside respectable boundaries. But for a moment, let's toss the soundtrack aside. What is left underneath? Not much of anything, sadly. The movie is badly edited, unfocused, misleading, boring, and clearly uninterested in establishing a central tone to carry the elements. For one brief moment, we admire director Brian Helgeland's ability to enthusiastically play out the story's numerous events, but when he manages to splinter the it through action, parody, romance and even sappy and manipulative melodrama, how in the world is the audience supposed to react? This is the kind of movie that gives new meaning to the phrase "you'll laugh till you cry." The star of the picture is Heath Ledger, an admirable young actor whom served as one of the only redeeming qualities in last year's painful war epic "The Patriot." Here, he plays William Thatcher, an ambitious would-be jousting warrior who seeks out to rise above his status as a mere peasant and become the greatest knight the jousting rings of France have ever seen. To do that, though, his identity as a servant must be protected, and the friends that accompany him throughout his (mis)adventures help to ensure its secrecy (one of whom is actually Geoffrey Chaucer, the author of "The Canterbury Tales"). Unfortunately, Thatcher's prime nemesis in tournament, the creepy Count Adhemar (Rufus Sewell), knows too much about Thatcher's actual identity and is on the verge of exposing the young soldier for the phony he is. The picture is like "The Mummy Returns" with the bandages removed--filled with endless but intentional contradictions, minus a noteworthy excitement factor and a thread of minimum common decency. We can find it possible to live with many of the inadequacies here (even the silly Nike product placement found within the film is forgivable), but the overall effect is less than acceptable when we see an audience cheering to the tune of "We Will Rock You," and a court of royalty dancing to the lyrics of David Bowie's "Golden Years." The movie's most curious mystery, though, is how it manages to be so careless with the setting, focusing in on the 14th century as if poverty, heated war and pestilence were not even around then. Plus, the movie takes place in France, and the majority of the cast speaks in British accents. Was this anachronism intentional, or just a mere oversight by either the writer or the director? As if an answer would matter. When it comes to style, "A Knight's Tale" feels very reminiscent of Luc Besson's "The Messenger," adopting set design and costumes that are seemingly simple but elaborate around the edges. Unfortunately, his material feels more like an early draft of ideas than a complete script. When his characters are not roaming through the scenery like lost dogs, his narrative travels like maple syrup through an ice maze--slow and disoriented, sometimes going in circles because it doesn't have clear sense of direction. Now that I think of it, maybe it isn't so crazy that the soundtrack distracts us from the substance. It's not like those of us annoyed by the music will miss anything.